Yesterday I attended a webinar that RightScale put on entitled: How to Build Scalable Websites in the Cloud. It was basically a welcome to RightScale, welcome to the cloud presentation but overall interesting and credible. One thing I noticed during the presentation and which warmed my heart was that MySQL played prominently in a bunch of the slides. It was only today when I was poking around the RightScale site that I saw the press release from a few weeks ago announcing that Marten Mickos, former MySQL CEO and Sun employee joined the RightScale board of directors. Its interesting but not surprising to note in the release that Marten calls out Sun and Canonical (the commercial sponsor behind Ubuntu) as two strategic partners helping to expand the RightScale ecosystem. 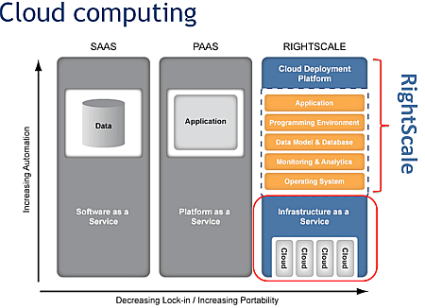 Where Right Scale fits within the tri-sected cloud. RightScale positions themselves as a cloud management platform or as I like to think of it “a cloud tamer.” If you split the cloud in three — software as a service, platform as a service and infrastructure as a service — they play in the last space. Basically Right Scale sits on top of Infrastructure as a Service (IAAS) and can handle all the tricky bits so you don’t have to. For those who want more control over their infrastructure RightScale will allow you to “choose among a variety of development languages, software stacks, data stores and cloud providers.” For those less intrepid in the cloud they have server templates that you can start off with. Tune in tomorrow for part deux! An interview with Marten Mickos, the day the MySQL deal with Sun closed — Feb ’08. An interview with Marten Mickos after he keynoted Canonical’s first (and last) Ubuntu Live — Aug ’07. This entry was posted on Wednesday, June 17th, 2009 at 1:00 pm and is filed under Uncategorized. You can follow any responses to this entry through the RSS 2.0 feed. You can leave a response, or trackback from your own site.